In conditions which are typical of the leading edge of a fast moving South Atlantic low, it is the ability to regulate speed and the level of attack which is being tested for the skippers at the top of the Vendee Globe fleet this morning. 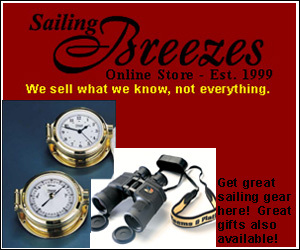 Winds are reported to be from just east of north at 25kts, with relatively flat water. The speedo on board Alex Thomson's race leading Hugo Boss has been hovering around 24-25kts for a 30 minute period and the British skipper is 112 miles ahead of second placed Armel Le Cléac'h on the early morning ranking. Speaking briefly to Race Direction this morning Vincent Riou (PRB) confirmed the conditions are ideal for 24 hour record pace. Lying second this morning Le Cléac'h said, "It's a great opportunity to put some miles behind us with a 20-25 knot NNE'ly wind and decent seas. We're fast with peak speeds of 27 knots. We should clock up more than 500 miles in a day. We have ideal conditions to get across the Atlantic and can look forward to three big days." This foiling folly should indeed last two or three days as they ride on the back of the low sliding down very rapidly towards the Roaring Forties. They are expected to pass the Cape of Good Hope on Friday 25th November in the middle of the afternoon, so in other words after a total of around twenty days sailing in the Atlantic… Unfortunately, not all of the frontrunners look like making it to the train on time. Jérémie Beyou (Maître CoQ) may find it hard to cling on, as this morning he only had around fifteen knots of wind, while those ahead of him had a 20-25 knot northerly already. Meantime, after his team reported last night that Bertrand de Broc had grown increasingly concerned about a noise from underneath the hull of his MACSF which the skipper has said may be the result of a collision with an object in the water when he was sailing off the coast of Portugal, De Broc is closing to the island of Fernando de Noronha. He was 17 miles off at 0600hrs TU making around 7kts and moderating his speed in order to arrive in daylight hours. The skipper of MACSF plans to shelter leeward of the islands without having to anchor, if the seas and winds allow. He plans to dive under his boat to further investigate the cause of the noise and vibration that appear when the boat exceeds 14 knots. Bertrand de Broc (MACSF) : "I'm around thirty miles from Fernando de Noronha. I slowed a bit, furling my headsail so as to arrive there in daylight. The sun rises here at around 0900hrs UTC. I'll then lower the mainsail once leeward of the islands. The goal is to dive to take a look under the hull. We have our suspicions, but we need to see. I have never heard this noise before and I've been sailing this boat for four years. We haven't done anything special to the keel, but we did carry out an X-ray inspection. I hit something off Portugal, but it didn't seem to be serious. The noise is unbearable when the keel comes into play. Crossing the Southern Ocean with such doubts would not be reasonable, so we need to check it out. I had Marc Guillemot on the phone and he has never heard such a noise either. 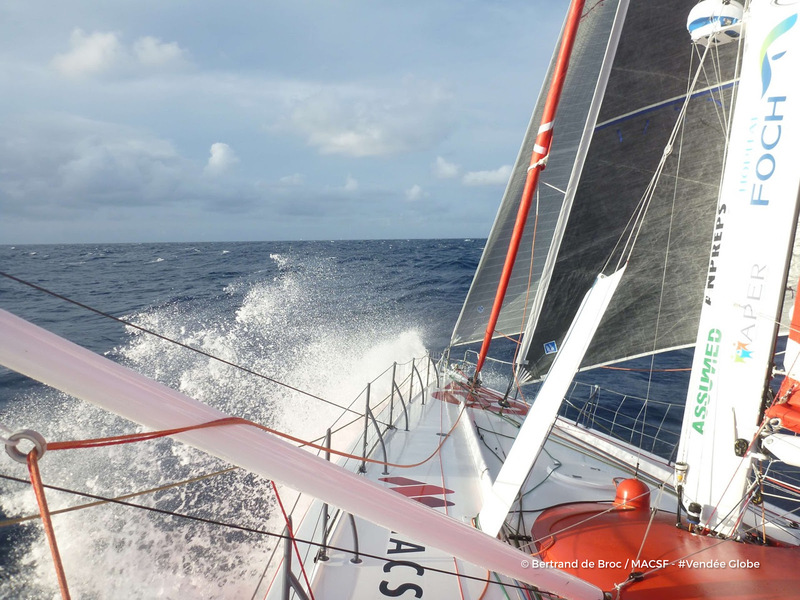 In the Transat Jacques Vabre, we got above 25 knots and never heard it." Armel Le Cléac'h (Banque Populaire VIII) : "We've made it onto the train. We're going down very quickly towards the Cape of Good Hope getting around the high. It's a great opportunity to put some miles behind us with a 20-25 knot NNE'ly wind and decent seas. We're fast with peak speeds of 27 knots. We should clock up more than 500 miles in a day, but the goal isn't to achieve records but to get as quickly as we can into the Southern Ocean. There's still a long way to go to get to Les Sables d'Olonne and so we have to pay attention to the equipment and not do just anything. The gaps are going to be huge and grow even bigger, but we knew that would happen at the start. The doors have closed on the chasing boats and the train has set off. We have ideal conditions to get across the Atlantic and can look forward to three big days. We should be able to catch our breath again just after the Cape of Good Hope." The radio sessions at 0900 and 1400hrs UTC will be open to the press on request. Please apply to the press service. Once recorded, these radio sessions will be made available to audiovisual media. These recordings are free of rights. - Live programmes (VENDÉE LIVE): 3 programs a day (LIVE from 1100hrs – 1130hrs UTC) in French and at 1200hrs UTC for the international skippers in English. - The live shows and radio sessions will be held in the TV studio - Vendée Globe Race HQ, quai Branly (Paris).